"Collective 4tet" is three New-Yorkers and one Swiss. 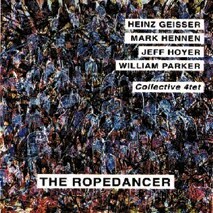 Heinz Geisser —­ perc., Mark Hennen —­ piano, Jeff Hoyer —­ trombone and William Parker —­ bass. "This music is about nothing more or less profound than the creative use of sound as it affects and represents the spirit. It's the aural manifestation of our common humanity. This music is to hear, music to experience. The work of these wonderful players is the purest of human constructs, art for the sake of art" (from liner notes by Chris Kelsey). Total time 56'14.